Hiya grillers! Looking back at some of my photos recently I came across a series of dinners where we devoured some amazing Australian Wagyu beef. The marbling rating was 6/7 and the cost was SGD $100/kg. QB occasionally gets Wagyu that in and it’s worth snapping up, if you’ve some extra cash on hand. Now, the cost may seem ridiculously expensive but it was at least $45 to $60 cheaper per kilogram than any other supplier I could find. Ergo, DEAL! I had the butcher cut the beef into three mammoth steaks. They were about 2.5 – 3 inches thick. He then vacuum sealed them individually so that we could (yikes) freeze two out of the three steaks. Prepping the first of the behemoths was simple as dry brining with a healthy coating of Kosher salt, that’s it! I brined them overnight so that the salt gets sucked into the beef penetrating as deeply as possible. To grill, I used the reverse searing method, setting up the Big Green Egg for indirect heat, stabilised at 225F (107C) with a handful of Beech wood chips. Allowing for a bit of smoke, gently bring up the temperature of the steak to 115F (46C) then remove it from the grill. Slather the steak with some pre-melted beef or lamb fat at the same time as bringing up your grill to scorching hot, direct heat. 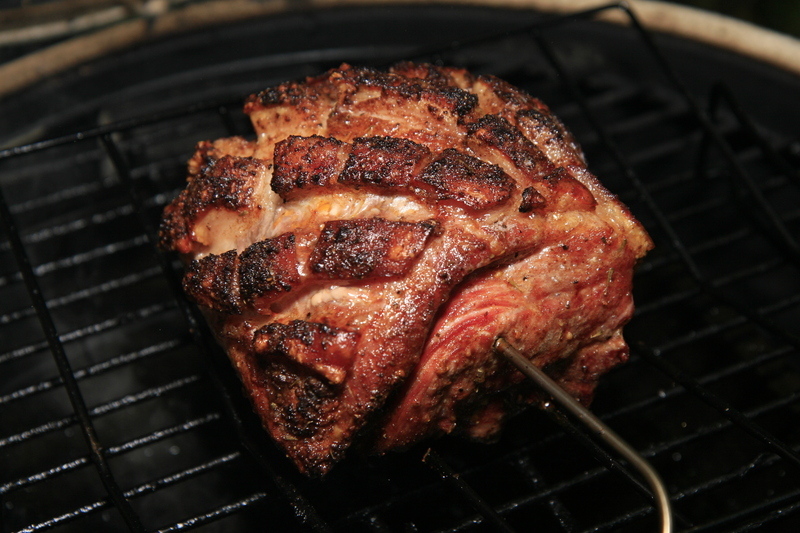 To minimise flame burn, I use Grill Grates for any searing, flipping them over to use them as a griddle top. The aircraft grade aluminium gets so hot that searing steaks is simple and quick. If you don’t own a set of theses, I highly recommend you get a set! You want to remove the steak once the internal temperature hits 123F (50.5C). Set it aside and let it rest for 5-10 minutes. It’ll rise another few degrees but you don’t want to bring the temperature more than 130F (54C). Slice on a 45 degree angle, nice and thin. Plate it on a platter and serve. With the fat content of these steaks, chewing was optional. Seriously, every single bite melted in your mouth with minimal effort. The taste was exceptional and honestly, I’ve not had it’s equal, not at home or in a restaurant! Super huge thanks to my dear colleagues Jeremy and Vicky for bringing along their “significant bests” to sample this beef with us. Yes, we had two sets of guests two weeks apart from each other. Despite freezing the other two steaks, they thawed perfectly in the fridge and the taste was just as good as the chilled beef. So we just returned from a two week holiday with our family in Toronto, ON. As part of the lodging deal I had to grill a few nights to make up for our stay. I promised my big brother Mark I’d write him a special blog entry customised for his Weber gas grill. Now, I’m no expert in these gas grill matters but I did give it a good go and I think if you follow these directions on your gas grill, you’ll pull off some seriously good steaks. Step 1 always starts with selecting your meat. We chanced upon some excellent ribeye at Costco – which I’d never get the chance to do here in Singapore but in Canada, it’s an inexpensive way to feed a large family. The quality is good enough and the prep of the steaks adds to the flavour of any steak. Having said this, always go with the ribeye cut – they don’t call it the king of steaks for nothing. Cut your ribeye steaks to an inch and a half thickness. Step 2 is a dry brine – about 1 hour before you’re ready to grill, liberally coat both sides of your steaks with Kosher salt. Not sea salt, not table salt but Kosher salt. If you use the others, you’ll over-salt the steaks and ruin them for sure! Once coated, throw the steaks back in the fridge. Step 3 calls for setting up your gas grill. At the same time, pull out your steaks from the fridge and cover them with a paper towel. Let them get to as close to room temp as possible. Set up your grill for indirect heat. What that means is if you have four burners like my brother does, heat up the far right burner and stabilise the internal temperature at about 225 to 250 degrees F. If you have a smoker adaptor, plonk that on top of the burner and get the smoke going. 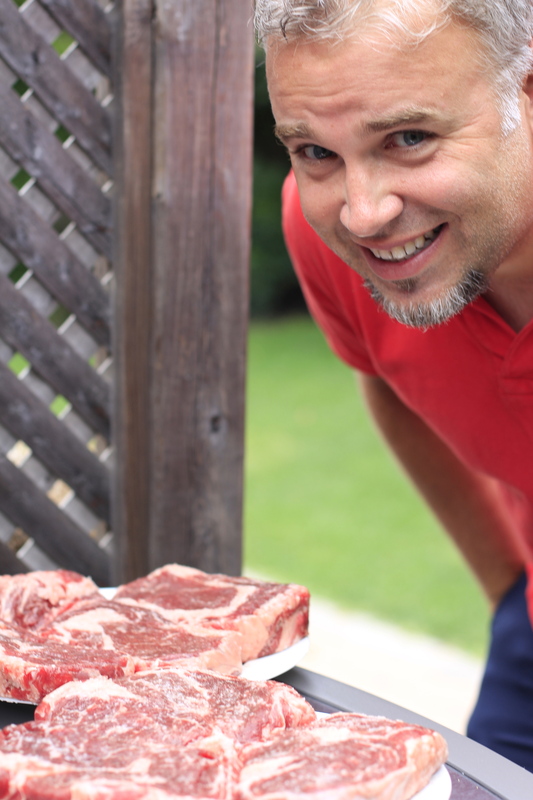 Step 4 – place your steaks on the other side of the grid away from the burner thats on. Close the lid and let the temp stabilise again at 225-250 degrees F. Leave the steaks on for 15 minutes then flip them. In total this step should take no more than 30 minutes – I went 40 and although the steaks were delicious, they came out medium instead of medium rare. Step 5 – take your steaks off and put them on a platter and liberally coat them with clarified butter (or regular butter if you can’t be asked) – At the same time, crank up all four burners and get that grill up to maximum temperatures! Step 6 – with the lid open place your steaks back on the scorching grid and let them caramelize! Basically you’re doing the reverse sear method that produces a wonderful crispy outside with a juicy inside. Keep flipping your steaks until you’ve reached a nice dark brown crust on both sides of the steak surface. This should take about 5 minutes. Step 7 is very important. Get your steaks off the grid and cover them in some aluminum (aluminium) foil and let them rest for 5 to 7 minutes. Now get your plates ready and any sides you wish to serve and you’re good to go. Save any and all cuts that aren’t eaten that night and use them up for steak and eggs – on our last morning with my family, Mark made us a wonderful breakfast with all the left over trimmings! Delicious the next morning. So, in all I’m used to this method on the Big Green Egg and way more comfortable that way but I must say, the challenge on a gas grill was worth the sweat – thanks again Mark, Christine and the kids for making our stay so memorable! 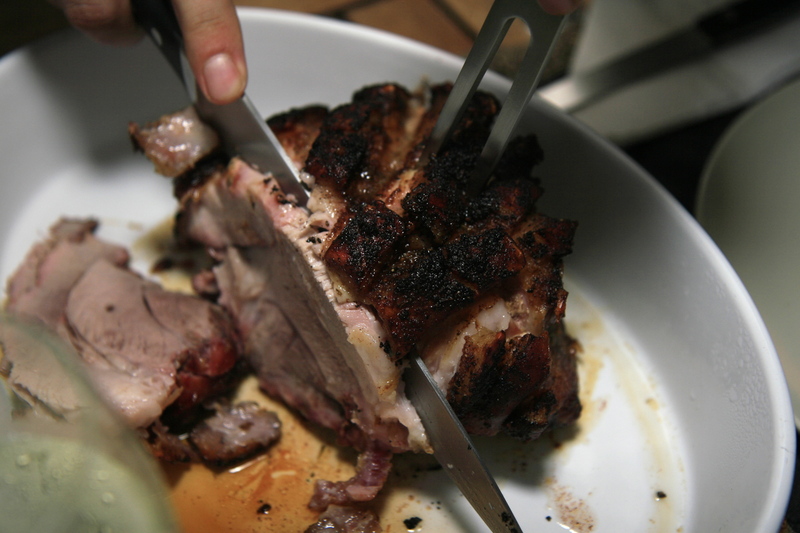 Hope you replicate this recipe and blow the minds of your guests during the short BBQ season that Canada has to offer! PS – sorry for the delay in getting another entry out. We’ve been so busy lately that I just haven’t had the time to write. The grilling continues the writing was in a bit of a rut! Right, so here we are, 100 posts in and what better way to celebrate this milestone with a great recipe that will challenge the most seasoned grillers? Reverse seared ribeye steak…what pray tell does that actually mean? Traditionally grillers tend to take a steak and slap it on a searing hot grill and 6 minutes later, you’ve got a wonderfully juicy medium rare steak that honestly taste pretty damn good. I came across a theory that talks about the wonderfully crunchy and tasty sear marks that are usually found on steaks however, the theory adds the critical question of why not have the entire steak surface turn into a tasty, crusty bark that keeps your taste buds flipping upside-down with every bite. You can find this wonderful article here: http://amazingribs.com/recipes/beef/steakhouse_steaks.html – Thank you Meathead for sharing this incredible recipe and method of producing what can only be described as the BEST STEAK we’ve every grilled. I won’t take credit for the method but I can corroborate the success of it all. Read the post above and give it a go. I will say that the timing on the low and slow portion of the cook was a lot shorter than 30 minutes. Trust your instincts along with a good digital thermometer. The searing bit…at the end of the grilling was a lot of fun and produced an incredibly tasty result. I also served the steaks with some leftover shitake/sake sauce that we used in this blog entry https://biggreenasianegg.wordpress.com/2011/07/07/smoked-threadfin-ikan-kurau-in-sake-sauce/– the sauce worked perfectly with steak though I do confess, my second helping consisted of only naked beef and it was equally delicious, if not a bit better! We served two huge ribeye steaks cut into 4 portions with some steamed sweetcorn, baked potato and garlic fried spinach. Very happy family and a huge score for the hundredth blog entry on the Big Green Asian Egg site.